Wacky World of Rubber: They don't make an emoji (_!_) for that? Goodyear Tire &amp; Rubber Co. When my family gets together, you can bet on the fact that there are going to be board games or card games involved. Things can get kind of intense, especially if the evening includes Dutch Blitz. One of my nephew's favorites games is Red Flags. The aim is to create the perfect blind date for someone else at the table. The catch is that everyone tries to sabotage your "perfect" person by giving them unflattering characteristics. The only thing of value this game has taught me is that the generation gap is real. Things that we "adults" dub a big deal, the "kids" shrug off. The best example may be when I tried to sabotage a blind date with a personality trait that involved that person texting entirely in emojis. While my sister-in-law and I found this completely appalling (full sentences with proper capitalization, spelling and punctuation, please! ), the kids shrugged it off: Meh. Emojis schmojis. A survey conducted recently by Goodyear Auto Service and Just Tires found that Americans of all ages really do love their emojis. Their tires, though, seem to be less appreciated. 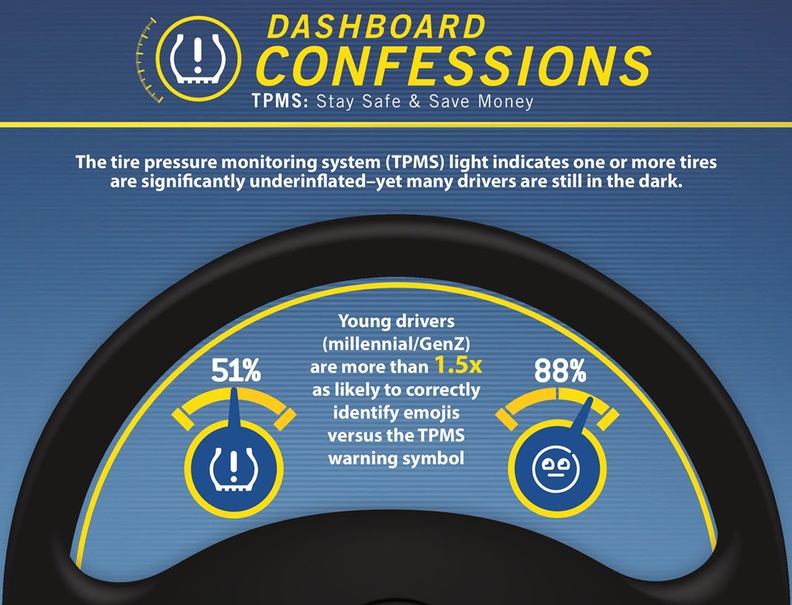 The survey, which questioned 1,000 drivers, found that roughly half of young drivers could not identify the TPMS warning light. Those same drivers, though, could easily text to let someone know that one or more of their tires are flat, probably without using actual text. The survey noted that about 88 percent of drivers in the millennial and Gen Z generations, could correctly identify common emojis. Before older generations smugly shake their heads, it should be noted that they don't appear to have done much better. Goodyear said that about 40 percent of all drivers could not identify the TPMS warning light. The fact of the matter is that too many drivers—of all ages—take their tires for granted. And the survey has other numbers to indicate that's likely the case. This surprised me because I easily could have identified the orange TPMS light that occasionally shows up on my dash. And I could have told you what TPMS stood for. My dad made sure of it. When I got my first full-time job, I had a 90-minute round-trip commute along a state route that doesn't see an overabundance of traffic. One of the first things I did was buy a reliable car—a brand new 2005 Toyota Corolla. One of the first things my dad showed me was the TPMS light, because my old car didn't have that. Heck, it didn't even have cupholders. 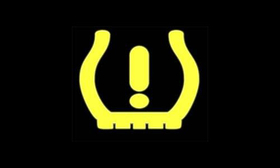 The TPMS light would come on fairly often, especially in the winter. Each time it did, I knew just want to do. For worst case scenarios, my dad and my brother had showed me how to change a tire, though, I'm sure I can't actually execute this (it's far easier to call them when I have a flat). They also made sure I knew how to check tire pressure and tread depth and how to properly inflate a tire. In fact, it wasn't uncommon for my brother and I to find digital tire pressure gauges in our Christmas stockings once we were old enough to drive. That awareness for tire maintenance and the TPMS light was something I took for granted, because I didn't know it was rare. More than that, though, I'm grateful my dad taught me. Goodyear's research supports the fact that I am one of the lucky ones. Most drivers, the survey said, don't even check their tires ahead of winter. Even those who live in areas where the winter weather takes a greater toll don't take time for tire maintenance ahead of the cold, as only 42 percent take time to check their tires ahead of the season. Before I started working for a pair of publications that cover the tire and rubber industries, I was one of those tire delinquents who didn't check her tires as often as she should have. (I'll admit, I still don't check my tires every month, though I am pretty good about routine auto maintenance and tire checks are part of that.) As I learn more about every aspect of the tire industry, I've come to genuinely appreciate my tires. I also understand that one of the most important things I can do is help my family and friends understand the value of proper tire maintenance. So I will do my best to remind my nieces and nephews about checking the tires on their own cars. But I'll probably have to tell them instead of text them. Because there isn't a tire emoji. Yet.